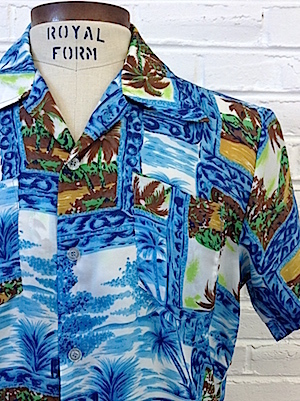 Home > Men's Vintage Shirts > Hawaiian Shirts > (M) Mens 70s Hawaiian Shirt! Crazy Patches w/ Palm Trees Amidst Blue Water Design! Mens vintage 1970s Hawaiian shirt! 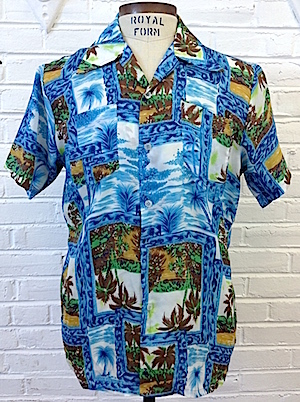 Amazing Hawaiian shirt features patches with palm trees that in blue, brown, tan, green and white! Pearly white buttons down the front with one square patch pocket on the chest. Straight hem with a nice, wide 70s collar. Tagged by Bardon Hawaiian. 100% Polyester.